This past week has been a bit tiring, but full of new experiences. I arrived, via a very small plane, last Monday on President’s day. My destination: the village of Faleasao, on the island of Ta’u, which is part of the three islands known together as Manu’a. Olosega, an island we visited while on one of our prized 3-day weekends away from school. It was breathtaking. Ta’u the island is only 17 square miles, and has a population of less than 800 (or is it 500?). So, picture a population the size of my graduating class living on one tiny island. It’s not so surprising that everyone knows everyone, is it? I was fortunate to arrive by plane, which took less than 40 minutes to travel the approximately 60 miles between the main island of American Samoa, and the even more remote island that will be my home until June. The volunteers who arrived here last semester had to take the boat, and almost everyone was very seasick by the time the 7-hour ordeal was over. The plane only started flying out again to Manu’a in September. Polynesian Airlines takes passengers between the islands twice a week, but because the airline is not an American company and is flying between two US territories, it must renew its approval to fly here each month, so fingers crossed that I avoid the boat when it’s time to go back. But back to last Monday. My roommate Erika, who teaches at the elementary, and my neighbor Colin, who is also a teacher at the high school, were there to greet me when I got off the plane. We loaded up the luggage and hopped on the back of a truck to travel the 7 miles to our village. As an aside, most cars in American Samoa are SUVs or trucks, with Toyotas, Fords, and Nissans being the most popular makes. It’s very typical for people to hitch rides on the beds of trucks, and it’s perfectly legal to do so as long as you’re not standing. The house I’m living in is small, but quaint. And the views don’t get better than ours. We live right in front of the ocean, so I not only see the waves, I constantly hear them, too. Throw in a sprinkle of palm trees and a dash of the occasional ocean breeze, and you get the breathtaking tropical island I’m now living on. Of course, it’s not all coconuts and sandy beaches. For example, we have cockroaches and termites co-habiting with us. The cockroaches mostly stay around the kitchen and only come out at night, so they don’t bother us too much. We do keep all our food in the fridge, though, and our garbage has a lid. We keep our silverware in a container, too. I’m pretty used to taking showers with spiders at this point as well, but they’re all daddy long legs and stay in the farther corners, away from the water and far enough from me. There is a pretty scary-looking spider that is found around where we live too, called a Huntsman spider. This guy can get as big as your palm, but he eats cockroaches and isn’t poisonous. If he eats cockroaches, I figure we can remain on civil terms. Oh, and remember those puletasis I talked about? Yep, they’re as hot as I thought they’d be. There’s no feeling like taking off a puletasi after a long day of school and jumping into a cold shower (no hot water here) to cool down. Lately the waves have been really rough, but jumping into the ocean after coming home from school is just as refreshing. School. Last week was finals week, so I didn’t do any lesson planning, though I did review and proctored an exam for my geometry sections. The school hasn’t had a needed math teacher for the past semester, so a local volunteer teacher was teaching geometry. He is a reverend, however, and has a full time job, so when I came last week he had been gone for a couple weeks. Not much has been learned in geometry, to say the least. The kids are your typical high school students. They can get rowdy, of course, but they are still interested in learning (granted, some more than others). The level of education is much lower here than in the States and most students are not particularly dedicated to their studies. As teachers, we have to adjust accordingly in creating lesson plans and finding a way to help the students understand the material through their individual learning styles. Can I just give a huge shout-out to my high school teachers. Teaching is a lot more work than I expected, especially since I’m teaching math. Though I understand the material, I have to relearn everything before each lesson because I learned the material long ago. Not only that, but I have to find a way to make the material accessible and understandable for all my students, some of whom don’t speak English well. Though we do have standards and objectives that we have to address in our courses, what I teach is almost entirely up to me, which can be overwhelming. I have a textbook to refer to, but I basically build each lesson from scratch: warmups, definitions, proofs, theorems, homework, quizzes, exams, projects, finals—everything is up to me. Intimidating, but challenge accepted. So, the school itself is pretty nice, with an open-air campus. There are 6 other palagi (white) teachers, and about 5 local teachers. The first week here I spent quite a bit of time cleaning out my classroom because it had been used primarily as a lab storage space before I came. Let’s just say many spider webs were destroyed, though I’m pretty sure most of the spiders ran off to build new homes. There are just too many spiders to try and catch ‘em all. And honestly, as long as they’re not crawling on my leg, the spiders just don’t bother me as much anymore. The school here is an interesting mix of great 21st century tools, coupled with a lack of basic teaching necessities. For example, I have a SmartBoard in my classroom. However, sometimes the power goes off and I can’t use it, and no one can seem to help me figure out how to use it beyond simply projecting things on the board. Also, I was given a Mac to use during my time here, but they didn’t have enough power cords to give me my own, so I share with Colin, the teacher next door. Expo markers are gold here, and we must supply our own. Same goes for markers, tape, glue, and scissors. They do have a lot of post-it notes, though. There are plenty of textbooks here, but many of them are old and outdated. I have a Calculus textbook to teach from, but no teacher’s edition that could provide me with answers to the problems. Despite all these minor issues, I am really lucky to be teaching where I am. 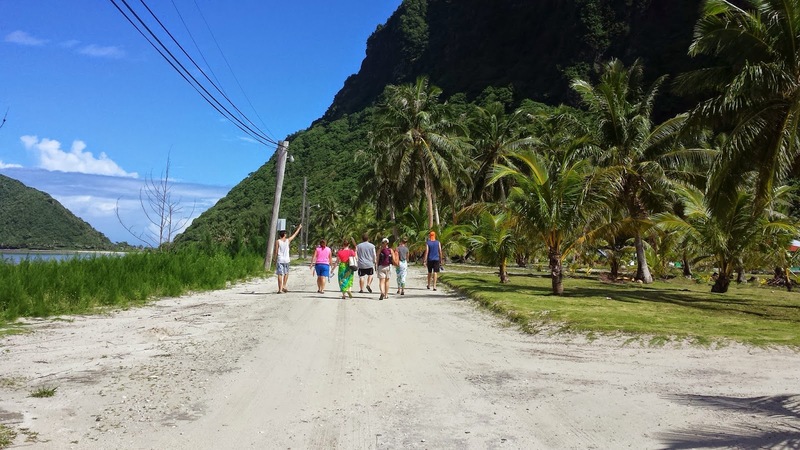 The administration in this school is very supportive of the volunteers here and cares about its students, which cannot always be said of the administration at other school in American Samoa. Well, this post is getting pretty long, and my prep period is almost over. I’m sure a lot of you are curious about cultural aspects of living here, etc., but I’ll have to touch on that in a separate post. La manuia le aso!